Is there a better alternative to Bookle? Is Bookle really the best app in eBooks category? Will Bookle work good on macOS 10.13.4? Bookle is a simple, elegant EPUB book reader, designed from the ground up to let you read your EPUB-formatted books without getting in your way. Bookle collects your books into its library, providing instantaneous single-click access to any title, and remembering where you left off in every book. Simple, efficient navigation controls (using the mouse, trackpad, or keyboard) let you read without distraction. You can switch between books in a single window, or open multiple windows to refer to several books simultaneously. Bookle can even read your books aloud to you. This will be the last version of Bookle and includes offers of discounts on other products as a thank you for past support of Bookle. 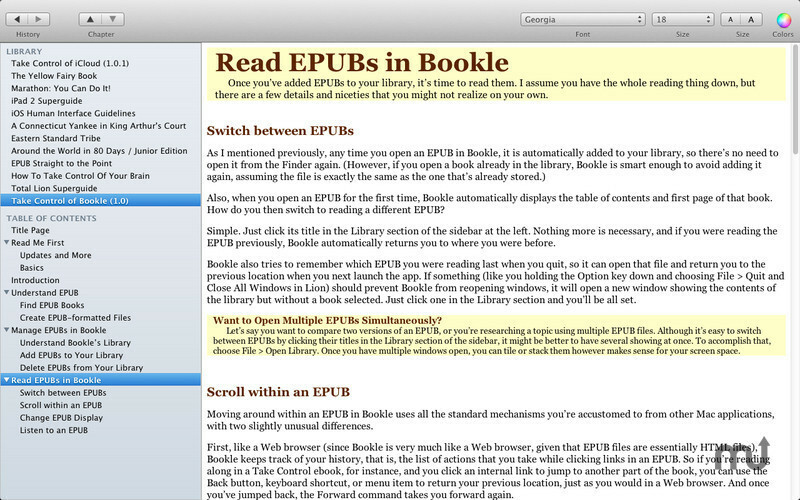 This version also accepts ePub and other case variants of the extension in EPUB documents. Bookle needs a rating. Be the first to rate this app and get the discussion started! Bookle is a collaborative effort of Adam Engst of TidBITS Publishing (publishers of the Take Control ebook series) and Peter Lewis of Stairways Software (creator of the file transfer tool Interarchy and current developer of the Keyboard Maestro macro utility). Bookle brings together Peter's programming skills and Adam's publishing and documentation experience, and it includes complete documentation in the form of a built-in ebook, "Take Control of Bookle." Bookle works under either OS X 10.7 Lion or 10.6 Snow Leopard. Please note that Bookle cannot display encrypted or DRM-shackled books, or books in formats other than EPUB.